Rich layers of vegetables, ground lamb and hearty mashed potatoes will warm you heart and soul. This easy shepherd’s pie recipe with ground lamb is an easy to make weeknight dinner anytime! I love making delicious food. I get a lot of satisfaction from kitchen successes, truly. When the Frenchman came to stay with us for a while, I had to kick my skills up a notch. Not that he would have complained or made a fuss over anything I made, but he loves his food. My hubby is famous for his shepherd’s pie. He loves to create the layers of vegetables, ground lamb and rich gravy. It’s the only thing he can cook well, but at least he has this, right? He and the Frenchman got together one day and decided that they needed to create the perfect shepherd’s pie, with ground lamb to be fully proper and all. When shepherd’s pie was first made in Northern England and Scotland in the early 1700’s, they used lamb or mutton (older sheep) for the meat. It was a common dish among sheep herders in that area. Back then, shepherd’s pie had a pastry crust that topped the meat and vegetables instead of mashed potatoes. Most of the time, shepherd’s pie has onions, garlic and peas in the casserole. Some will replace those with green beans, or add carrots. Tater tots have been seen to top this dish, replacing the mashed potatoes as well. One of the best things about cooking on the homestead is creating a dish with ingredients you have on hand, that your family will love. This is such a dish. Hubby and the Frenchman opted for traditional ground lamb, peas, carrots, onions and a rich lamb broth. When hubby is following a strict paleo diet, he will sub out the white mashed potatoes for mashed sweet potatoes or even roasted radishes on the top. The Frenchman loves his starchy foods, so uber traditional they went. It’s the ultimate comfort food. First, in a heavy bottomed skillet, they had to brown the lamb with chopped onions and garlic. Sauteed for about 10 minutes until the lamb was browned through and the vegetables began to sweat. Then, they added in sliced carrots and frozen peas, and stirred to combine. Heat on the stove top for about 5 minutes, then remove from heat and set aside. The lamb broth was made in advance (you can see how we make it here with beef broth with beef bones-same concept, just use lamb bones from your butcher) and they first made a roux. Melt 2 tablespoons butter and add 2 Tablespoons fresh milled flour. Stir to combine and allow the roux to cook for 2-3 minutes to remove the “raw” flour taste and to add another layer of flavor. Season each layer as you go, with salt and pepper. The Frenchman loves lots of herbs and spices! Add 2 cups of broth, stirring constantly and allow to thicken slightly. Now, they had to deal with the mashed potatoes. They had some golden Yukon potatoes bubbling on the stove while they were browning the lamb and other vegetables. Hubby drained the water, added 4 Tablespoons butter, ½ cup milk, and 1 Tablespoon sour cream. Of course, don’t forget the salt and pepper, even on this layer! The potatoes, butter, milk and sour cream were placed in a stand mixer with the flat blade attached. Hubby whipped them until they were light and fluffy. Each casserole dish was then topped with ½ cup or so of the creamy mashed potatoes. The casseroles were then placed in a preheated 375 degree oven for 20 minutes to fully heat through and to give the mashed potatoes some crispy edges. The Frenchman insists on crispy edges for most of his food. The only exception would be ice cream, but that’s another story. They allowed the shepherd’s pie to cool for 5 minutes before serving. Once it cooled slightly, we were able to dig in and enjoy this! So filling, and satisfying! Even in summer, this is a must make dish, at least once a month. Now, if you wanted to, a small glass of red wine would be very tasty with this. Lamb and other red meat pair well with red wines. I would personally choose something a bit more on the sweeter side to balance out the strong flavors of the lamb, but even a dry red wine would be nice. Of course, if you don’t drink alcohol, water, tea or even grape juice would be nice. Maybe a tall cold glass of kombucha? See here how to make it for yourself! I hope you enjoy this shepherd’s pie recipe as much as they enjoyed making it! Be sure to pin this for later, too! Add 6 quarts of water to a deep pot and place potatoes in water, and bring to a boil. In a heavy bottomed skillet, brown the lamb with chopped onions and garlic. Sautee for about 10 minutes until the lamb is browned through and the vegetables began to sweat. Add in sliced carrots and frozen peas, and stir to combine. Heat on the stove top for about 5 minutes, then remove from heat and set aside. To make the roux: In a separate pan, melt 2 tablespoons butter and add 2 Tablespoons fresh milled flour. Stir to combine and allow the roux to cook for 2-3 minutes to remove the “raw” flour taste and to add another layer of flavor. Add 2 cups of broth, stirring constantly and allow to thicken slightly. Combine the gravy with the ground lamb and vegetables and stir together. Add 4 Tablespoons butter, ½ cup milk, and 1 Tablespoon sour cream. Place potatoes, butter, milk, and sour cream in a stand mixer with the flat blade attached. Top casserole dish was then topped with ½ cup or so of the creamy mashed potatoes, if using ramekins or spread evenly across 9x13 dish. Place in oven for 20 minutes to heat through and brown the mashed potatoes on top. This looks so satisfying! Are you grinding you own lamb or asking the butcher — I’ve only worked with lamb roasts before. Looks so comforting! My family loves mashed potato anything, so I know these would be enjoyed! 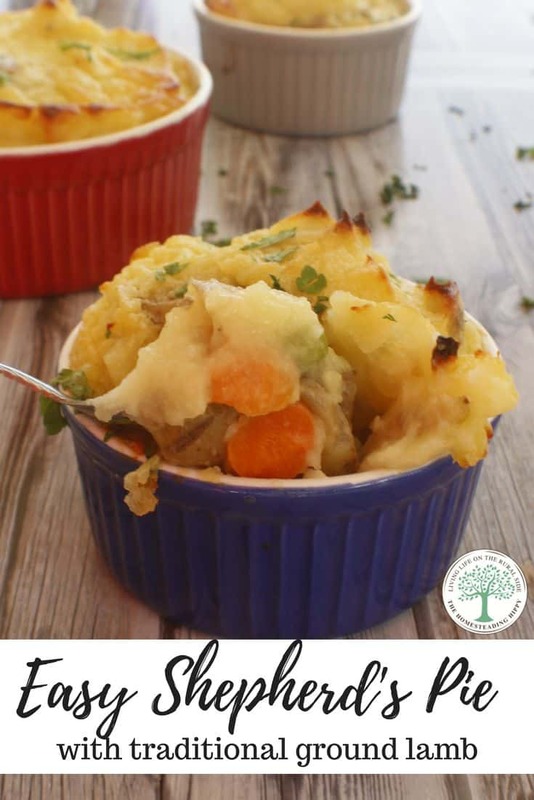 I absolutely love shepherds pie and I bet it’s delicious with lamb! Looks so warm and comforting. I have only used ground lamb in lamb patties. I need to try this! This looks so warm and comforting. just the kind of meal my teenage boys would love. This looks amazing, definitely one of my favorites. Lamb is the best! THE ultimate comfort food! This recipe looks and sounds SO good! Easy too. Thanks!! This looks so comforting and delicious! I love how easy it is to make too! Shepherd’s Pie truly is some serious comfort food. My husband LOVES it, it’s one of his favorites. Your version sounds great! What a great meal to share with friends and family! I haven’t made it in ages, but I’m really craving it now. Love shepherds pie. So creamy and delicious ! My husband would love this ! Yum! I love using lamb for shepherds pie, I didn’t realize the others were called cottage pie! Thanks for sharing!